These are the conclusions of “Operationalizing of the Security Sector Reform in the Western Balkans,” a 124-page investigation by the Institute for European Policy commissioned by the German Bundeswehr and issued last January. This month the text turned up on a weblog. It is labeled “solely for internal use.” Provided one can plow through the appallingly dense Amtsdeutsch - “German officialese” - that is already evident in the ponderous title, a reader is rewarded with sharp insights about Kosovo. What was he doing here?” I inquired. “Ich verbloede,” he replied - “I am stupefying myself.” - (or, I am making myself stupid). 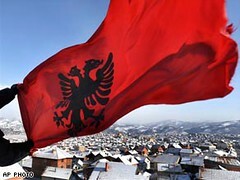 However, in their depiction, Kosovans appear equally beholden to legend - in their case of historic exploitation - such that if they finally achieve independence, all will suddenly be well. In the past Kosovans could and did always blame somebody else for their troubles: Ottomans, Yugoslavs, Serbs. Now they have begun to blame UNMIK. But what will happen if they have only themselves to blame? *David Binder (born 1931) was a correspondent for The New York Times from 1961 until 2004. He specialized in coverage of central and eastern Europe, based in Berlin, Belgrade and Bonn.